Scott, M. (2007). 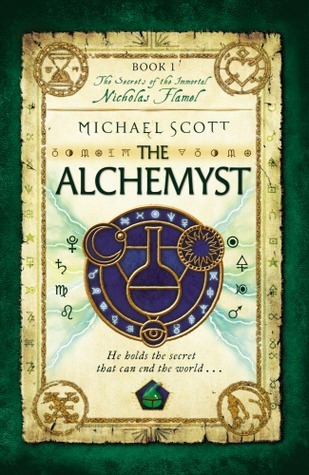 The Alchemyst: The secrets of the immortal Nicholas Flamel. New York: Delacorte. Personal reaction to the book: This is a worthy follow-up to J. K. Rowling for YA readers who have memorized Harry Potter and are looking for another fantasy series to pick up. Scott has a well-imagined, fully realized fantasy world that doesn’t rely on its predecessors (so no orcs or headmasters) and is heavily grounded in historical paganism. This is definitely not a standalone book, however. Start to enjoy it and a reader will be in for the long haul as it ends on a cliffhanger with none of the plot threads resolved. The richness of the intermingled real / fantasy world gives it a distinctive flavor. It also adds to the heft of the book / series. I’ll definitely follow this one as my boys read it. It would make a good chapter book for bedtimes. Author facts: Michael Scott is Irish. He is a noted Celtic folklorist, which knowledge he drew on for the Nicholas Flamel series. He was Writer in Residence in 1991 for Dublin’s year as European City of Culture.